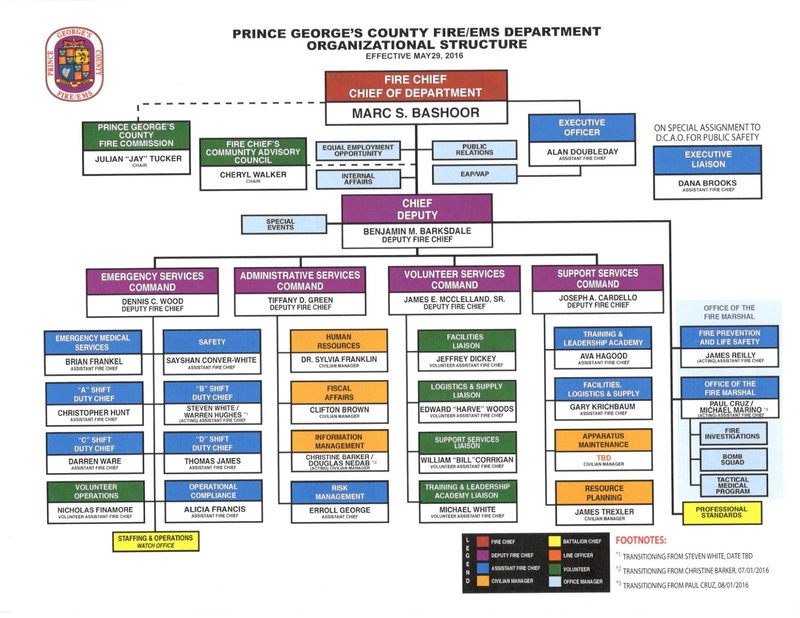 Several organizational changes have been announced by the Prince George’s County Fire/Emergency Medical Services (EMS) Department, including the appointment of a Chief Deputy, realignment of reporting structures, promotions and filling of various command staff positions newly created and previously vacant. Chief Deputy: Deputy Fire Chief Benjamin Barksdale will be promoted to the rank of Chief Deputy. The Office of the Fire Marshal and Special Events will continue to be a part of Chief Barksdale’s area of responsibility. The other Deputy Fire Chiefs will report through Chief Deputy Barksdale. Support Services Command (SSC): Assistant Fire Chief Joseph Cardello will be promoted to the rank of Deputy Fire Chief for the Support Services Command. The Training and Leadership Academy, Apparatus Maintenance, Facilities, Logistics, and Supply, and the Resource Planning office will report to SSC. Administrative Services Command (ASC): Assistant Fire Chief Tiffany Green will be promoted to the rank of Deputy Fire Chief for the Administrative Services Command. Human Resources, Fiscal Affairs, Information Management, and Risk Management will report to ASC. Additionally, on May 29, 2016, Acting Assistant Fire Chief Sayshan Conver-White will be promoted to the rank of Assistant Fire Chief. AFC Conver-White will continue to manage the Department’s Safety program. Battalion Fire Chiefs Ava Hagood, Warren Hughes, Christopher Hunt, Michael Marino, and James Reilly will enter acting Assistant Fire Chief positions or receive promotions over various dates in the next 60 days. The Department continues to examine opportunities available to fill the vacant Apparatus Maintenance Manager position. Congratulations to all those promoted!! !